... not sure I'll have the guts to walk around without a scarf, and not sure if I'll shave to the skin ... but these women give me courage! I'm thinking a little make-up and maybe some jewelry will help. Holy cow, Denalee!! That is wonderful and courageous. I have no doubt that you will be as beautiful without hair as you are with. Your mom is indeed fortunate to have a daughter like you. I am thinking you will look just like that first girl (who I can not remember the name of for the life of me) and I think she looks FABULOUS! I can't wait! You are so courageous and selfless! Wow Caci & Rebecca ... THANK YOU! 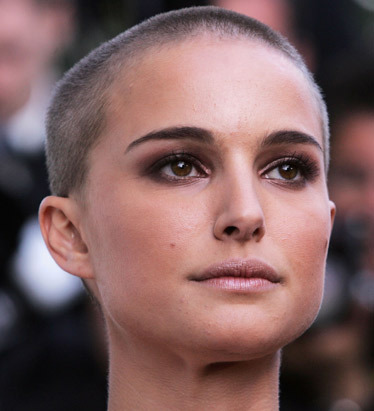 I LOVED when Natalie Portman (first picture) shaved her hair. She looked amzing. Inspired by her and tired to fight with her curls, a close friend of mine did the same. And you know what?? Not only hollywood superstars look great with shaved heads. She looked great. And you will too!!! What an amazing thing you're doing, and I think you will look gorgeous... last weekend I saw a stunning woman at the deli with her head shaved... she was all dressed up and I just couldn't take my eyes off of her, she was so beautiful! Yes it can, I'm not sure it would be my best look ever, but definitely empowering. You are amazing. If you read back through my blog when you visited you know that I'm dealing with my mom's serious health issues too. My mom was supposed to be having chemo by now, but a massive stroke ended that hope. So, she won't lose her hair...but, we will lose her probably sooner than later. It is so hard isn't it...realizing that our mothers aren't superhuman. I think what you are doing for your mother is such a great gift of love. As for the look...my mom and I had the discussion when she thought she was having chemo. She would have wanted a wig. I get so hot...I would wear really funky scarves in all sorts of bright colors. you'll look beautiful! and if you're having a less confident day, mascara and some blush can do wonders and make you feel like a million dollars!